The primary objectives of the eleven-day mission were to demonstrate the command and service module and crew performance, space vehicle and mission support facilities performance, and the command and service module rendezvous capability. Apollo 7 spent more time in space than all the Soviet space flights combined up to that time. The space vehicle was launched at 11:02:45 am EDT, October 11, 1968, and was inserted into a 123- by 153-mile earth orbit. 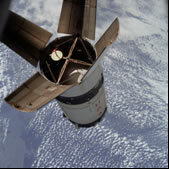 The command and service module was separated from the Saturn IVB stage approximately three hours after launch, and the separation was followed by spacecraft transposition, simulated docking and stationkeeping with the S-IVB. The spacecraft for the Apollo 7 mission consisted of a launch escape system, command module, service module and a spacecraft-lunar module adapter that served as a mating structure to the instrument unit on top of the S-IVB stage of the Saturn IB rocket. This mission did not include a lunar module. A number of hardware changes were made to the Apollo spacecraft since the fire that killed the prime crew of Apollo 1. A single quick-operating outward opening crew hatch replaced the two-piece hatch; the new aluminum and fiberglass hatch could be opened in a matter of seconds by both the crew and pad safety crew. In addition, the launch pad spacecraft cabin atmosphere for pre-launch testing was changed from 100% oxygen to a mixture of 60% oxygen and 40% nitrogen, a mixture that was selected after extensive flammability testing. Walter M. Schirra, Jr., Mission Commander, was born on March 12, 1923, in Hackensack, New Jersey. His education included training at the Newark College of Engineering and the U.S. Naval Academy, Safety Officers School of U.S.C., U.S. Navy Test Pilot School, and NASA Astronaut Training from 1959 to 1969. He received numerous honorary doctorates from several institutions of higher learning. Schirra was one of the seven Mercury Astronauts named by NASA in April 1959. In 1962, he piloted the six orbit Sigma 7 Mercury flight, served as backup command pilot for the Gemini III Mission, and was the Command Pilot on the history-making Gemini 6 flight. The highlight of this mission was a successful rendezvous of Gemini 6 with the already orbiting Gemini 7 spacecraft, thus, accomplishing the first rendezvous of two manned maneuverable spacecraft. Schirra retired from the Navy as a captain and from NASA in 1969. He is unique in that he is the only Astronaut to have flown Mercury, Gemini, and Apollo. He remained involved with business and civic activities until his death on May 2, 2007. Donn F. Eisele, Command Module Pilot, was born on June 23, 1930, in Columbus, Ohio. He received a Bachelor of Science degree from the United States Naval Academy in 1952 and a Master of Science degree in Astronautics in 1960 from the Air Force Institute of Technology, Wright-Patterson Air Force Base in Ohio. He was a project engineer and experimental test pilot at the Air Force Special Weapons Center at Kirtland Air Force Base, New Mexico and was one of the third group of astronauts selected by NASA in October 1963. In addition to flying on the Apollo 7 mission, he served as backup command module pilot for the Apollo 10 flight. Colonel Eisele retired from the Air Force and left the space program in 1972. He later served as Director of the U.S. Peace Corps in Thailand and worked in private industry. Eisele died suddenly of a heart attack on December 2, 1987 while on business in Tokyo. R. Walter Cunningham, Lunar Module Pilot, was born on March 16, 1932, in Creston, Iowa. He received a bachelor of arts degree with honors in Physics in 1960 and a master of arts degree in Physics in 1961 from the University of California at Los Angeles and completed work on Doctorate in Physics with exception of thesis. Cunningham joined the Navy in 1951, began his flight training in 1952 served on active duty with the United States Marine Corps from 1953 to 1956 and in the Marine Corps Reserve program until 1975. His present rank is Colonel, USMCR (Retired). He joined NASA as one of 14 astronauts named in October 1963, the third group of astronauts selected. From 1968 to 1971, he served as NASA Chief of the Skylab Branch of the Astronaut Office. After leaving NASA, he held a number of executive and management positions in private industry. He is currently a writer, lecturer, and consultant. Back-up crew for this mission were Thomas Stafford (back-up commander), John Young (back-up command module pilot), and Eugene Cernan (back-up lunar module pilot). The spacecraft experienced a normal deorbit, entry and landing sequence, splashing down in the Atlantic Ocean on October 22, 1968 at 7:11:48 am (EDT). Apollo's flotation bags had their first tryout on this mission. Mission elapsed time was 260 hours, 9 minutes, 3 seconds. Splashdown was 200 nautical miles SSW of Bermuda and 8 miles north of the recovery ship USS Essex. The Apollo 7 command module is currently on display at the Frontiers of Flight Museum located next to Love Field in Dallas, Texas.